Let’s start off with some quick October gardening tips From The Ground Up: What a pleasant time to be outside cleaning up summer veggie beds. While doing so, be sure to shovel in some yummy manure, compost & a lovely dose of mulch. Don’t forget to harvest winter squash and pumpkins. Store these colorful squash in a cool, dark place. Pull up dead annuals. Plant garlic, shallots, chard, and maybe some rhubarb. Dig and divide perennials. Rake leaves, shred and add to the already existing mulch pile. Plant spring bulbs now. What a beautiful time to be outdoors & experiencing the bountiful fall harvest. By far, my favorite time of year for growing food, hiking, biking, fishing & feeling the change all around. It’s been a moment since my last blog, I recently had a scary fall on my mountain bike & are finally back to riding everyday. 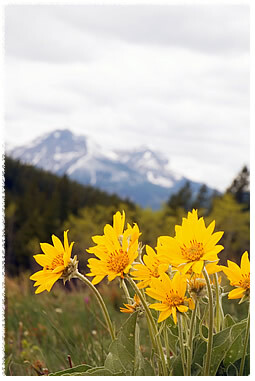 In working through my trauma & healing of my body, I developed a lovely relationship with the medicinal Arnica. It greatly helped with the swelling of my knee, helped with my bruises and overall aches of my body. The plant itself can grow 1-2 feet and has bright-yellow daisy looking flowers, it can be found in upland grassy, moist meadows around July-August. If you have a section in your yard with similar conditions you may want to try growing it. You need this in your medicine cabinet. Whether it’s diluted homeopathically, ointment or in gel form it is a must in every household.